The play Posh was a huge success after it premiered at the Royal Court Theatre in London in 2010, before transferring to the West End. Now it’s getting the movie treatment, under the title The Riot Club, with a cast full of bright young things including the likes of Sam Claflin, Max Irons and Douglas Booth. Now a new clip has arrived which shows Claflin getting initiated into the titular club with a very nasty drink. It’s not exactly the sort of club I’d like to initiate Claflin into, although I wouldn’t mind if Douglas Booth was involved as he is here. The Riot Club (previously) known as POSH, certainly has an attractive cast of young guys, but that doesn’t mean the movie will be any good. However now we have a taste with a trailer and poster. 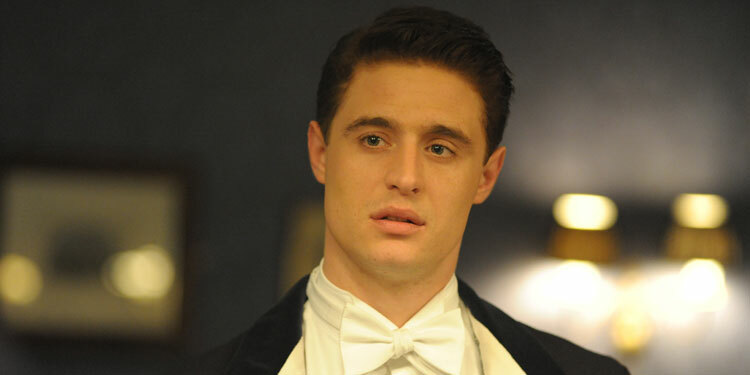 Here’s the synopsis: ‘Set amongst the privileged elite of Oxford University, THE RIOT CLUB follows Miles (Max Irons) and Alistair (Sam Claflin), two first year students determined to join the infamous Riot Club, where reputations can be made or destroyed over the course of a single evening. In 2010 The Royal Court Theatre in London had a major success with Laura Wade’s Posh, which premiered at the venue and then transferred to the West End. Now it’s becoming a film and they’ve got some of the best – and prettiest – young British actors to fill out the cast, including Catching Fire’s Sam Claflin, Romeo & Juliet’s Douglas Booth and The Host’s Max Irons. The first images from the movie have been released, which you can see below (click on them for larger versions). Here’s the synopsis: ‘Set amongst the privileged elite of Oxford University, POSH follows Miles (Max Irons) and Alistair (Sam Claflin), two first year students determined to join the infamous Riot Club, where reputations can be made or destroyed over the course of a single evening. POSH is directed by Lone Scherfig, who most recently helmed ‘One Day’, and the Best Picture Academy Award nominee ‘An Education’. It is produced by Pete Czernin and Graham Broadbent of Blueprint Pictures (‘The Best Exotic Marigold Hotel’, ‘Seven Psychopaths’). It’s due out in UK cinemas on September 19th. For the last decade or so Christopher Nolan has gone from unknown to one of the most powerful directors on the planet, but it should always be remembered that he’s had a hand in the script for all his movies (often working alongside his brother, Jonah). Now he’s written something for someone else to helm, alongside co-writer Michael Stokes. The Keys To The Street is based on a Ruth Rendell novel, with Variety reporting that Gemma Arterton and Tim Roth are set to star. Knowing Nolan, he’ll have made the material his own, even if he’s handed the helming reigns to Czech director Julius Sevcik, who plans to shoot the movie early next year. Previous looks at The Host have deliberately made it look like the new Twilight, which isn’t surprising considering it’s also based on a novel by Stephenie Meyers. However this new trailer allows it to be its own beast, playing up the sci-fi and action more than the romance. In The Host, our world has been invaded by an unseen enemy. Humans become hosts for these invaders, their minds taken over while their bodies remain intact. Most of humanity has succumbed, including Soarise Ronan’s main character, Melanie Stryder. However while normally the human is completely subdued by their host, in Melanie’s case, her personality flashes through, intriguing her Host, known as Wanda, and setting them off on a quest to find the last free humans. Ronan, Jake Abel, Max Irons and William Hurt star in the movie. The film hits cinemas in both the UK and US on March 29th. 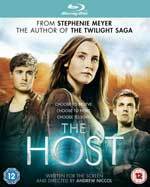 The Host hits cinemas on March 22nd, bringing another Stephenie Meyer (Twilight) book to the big screen. Now a quartet of new images from the film have arrived, showing the likes of Saoirse Ronan, Jake Abel, Max Irons and William Hurt. In The Host, our world has been invaded by an unseen enemy. Humans become hosts for these invaders, their minds taken over while their bodies remain intact. Most of humanity has succumbed, including Soarise Ronan’s main character, Melanie Stryder. However while normally the human is completely subdued by their host, in Melanie’s case, her personality flashes through, intriguing her Host, known as Wanda, and setting them off on a quest to find the last free humans. Stephenie Meyer isn’t just about Twilight, as she’s also written The Host, which has a movie adaptation just weeks away from release on March 22nd. Now a couple of new characters posters have shown up online, featuring Saoirse Ronan’s Melanie Stryder and Max Irons’ Jared Howe. In The Host, our world has been invaded by an unseen enemy. Humans become hosts for these invaders, their minds taken over while their bodies remain intact. Most of humanity has succumbed, including Soarise Ronan’s main character, Melanie Stryder. However while normally the human is completely subdued by their host, in Melanie’s case, her personality flashes through, intriguing her Host, known as Wanda, and setting them off on a quest to find the last free humans. Jake Abel, Max Irons and William Hurt also star.